This year, two high school seniors will graduate from Faith Lutheran School. 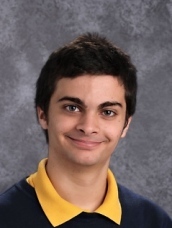 Learn more about Faith Lutheran School Class of 2018 Valedictorian Phillip Merritt. Where do you plan to attend college and major in, and what are your career plans? I willbe attending Collin College in the Fall before transferring to Texas A&M in the Spring of 2019. I plan to major in Mechanical Engineering and then pursue a career working for military contractors. What school activities have you been involved in? I have played football, basketball, and volleyball. I am this year’s student body president and also the main yearbook editor. What teacher impacted you the most and how? The teacher that impacted me the most was my Calculus II teacher, Dustin Potter. After my Calculus I class the semester before, I had become disinclined to continue my studies because of stress and struggle of Calculus I. However after taking Dustin Potter’s Calculus II, I discovered that it was not that I was bad at this type of work, but the teaching style of my previous teacher. What is the most interesting school project/assignment you have done? Please describe. The most interesting assignment was in my welding and metal sculpture class over at Collin College. We were tasked with making a bell out of bronze. However the task was not as simple as it sounds. It could not be a common bell (e.g. think the Liberty Bell). I chose to make mine shaped like a fish. It was made of the following four pieces: the body, the tail, the dorsal fin, and the clapper. What advice do you have for future high school graduates? My advice for future high school graduates is as follows: Do no wait to take your SAT and ACT. I waited too long on both and found out that my scores were less than satisfactory. I wanted to retest but I did not have the time. However if you do find you have waited too long before testing, do not get disheartened by the fact that you might need on semester to retest after graduation. ← FLS 2018-2019 School Calendar 2018 Golf Tournament → This entry was posted in Classroom News, Homepage News. Bookmark the permalink.